The night lights of the Americas shine in this visualization of our planet at night, which is based on data acquired by the Suomi NPP satellite in April and October. The image, released by NASA Earth Observatory today, has been nicknamed the "Black Marble." NASA is known for its "Blue Marble" images, which show Earth's sunlit disk as seen from space — and now it's making a splash with the nighttime view, nicknamed the "Black Marble." This picture of the night lights of North and South America is just one frame in the Black Marble series, which is based on data from the Suomi NPP satellite and was unveiled today during the American Geophysical Union's fall meeting in San Francisco. The image has been built up from readings made by the weather/climate satellite's Visible Infrared Imaging Radiometer Suite, or VIIRS. It'd be tough to snap this kind of picture at any single moment, because of cloud cover as well as seasonal changes in the way sunlight falls on our planet. Suomi NPP's handlers had an easier job, because the satellite could make multiple passes in April and October. Those fly-overs produced data that could be presented as a full-disk nighttime view of Earth. NASA says the VIIRS instrument's "day-night band" is well-suited to pick up on dim signals such as city lights as well as gas flares, auroras, wildifires and reflected moonlight. For the Black Marble images, stray sources of light were removed during processing to emphasize the city lights. "Artificial lighting is an excellent remote-sensing observable and proxy for human activity," Chris Elvidge, who leads the Earth Observation Group at the National Oceanic and Atmospheric Administration's National Geophysical Data Center, said in today's image advisory. NASA has released satellite images showing the night lights of Earth. NBCNews.com's Dara Brown reports. Weather forecasters are using the VIIRS imagery to track fog and low clouds through the night — which can be a concern for high-traffic coastal airports such as San Francisco. But it's not just about the weather: Researchers can track night lights over time to estimate economic activity and population growth. For example, satellite images graphically show how North Korea's economic development has lagged behind that of its neighbors, or how India has developed through the decades. Night-light pictures can also help facility planners decide where to put astronomical observatories that need dark skies, or help emergency officials gauge the extent of power outages. 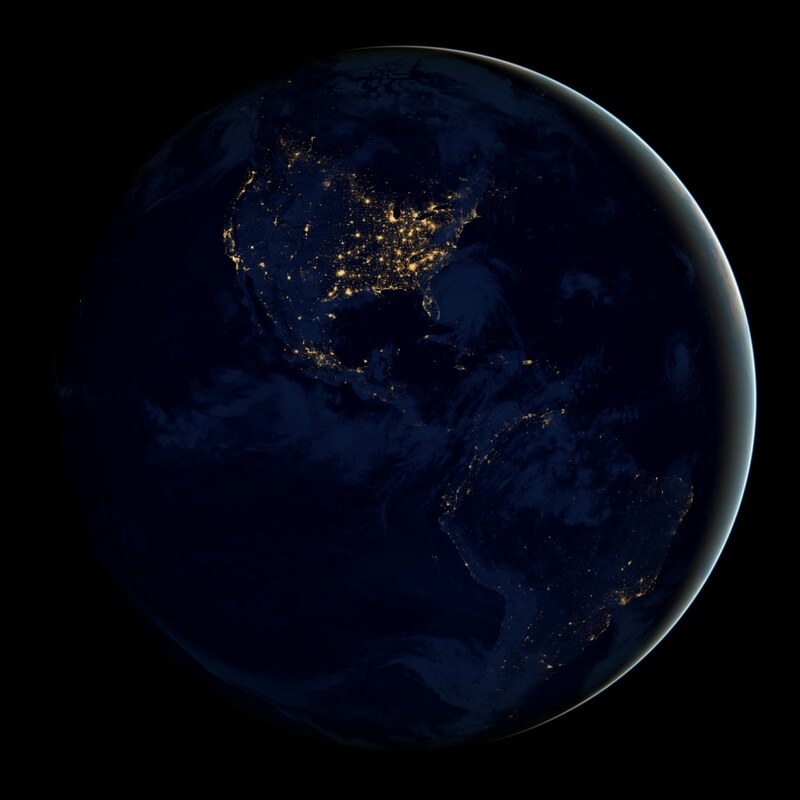 A NASA video guides you through the "Earth at Night" imagery. Be sure to choose the HD version. This composite map of the world was assembled from data acquired by the Suomi NPP satellite in April and October 2012. Check out the full array of Black Marble imagery, including an animation, at the NASA Earth Observatory website or Goddard Space Flight Center's Flickr gallery. Oh, and don't miss NASA's "White Marble." These Black Marble views serve as today's offering in the Cosmic Log Advent Space Calendar, which cracks open a fresh picture of Earth as seen from space on a daily basis from now until Christmas. For more Advent calendar goodness, turn to The Atlantic's Hubble Space Telescope Advent Calendar and the Zooniverse Advent Calendar. Alan Boyle is NBCNews.com's science editor. Connect with the Cosmic Log community by "liking" the log's Facebook page, following @b0yle on Twitter and adding the Cosmic Log page to your Google+ presence. To keep up with Cosmic Log as well as NBCNews.com's other science and space news coverage, sign up for the Tech & Science newsletter, delivered via email. You can also check out "The Case for Pluto," my book about the controversial dwarf planet and the search for new worlds.